This is a classic news article about two kinds of hot topics: funeral directors and freakish weather events. You put these two things together and WHAMMO, you’re king of the world. So right now in Washington, DC (which is still digging out from under three feet of snow) local funeral directors are working working working because people keep dying. 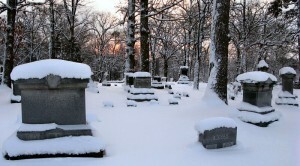 Indeed, mortality rates tend to go up during heavy snow storms because of accidents and strenuous shoveling. Meanwhile, cold weather and snow forces some cemeteries to close, which in turn forces families (and therefore funeral directors) to scramble when it comes to interment, calling around to find open graveyards or, alternatively, storage facilities until the snow clears. Funeral directors may work around the clock, sleeping at work among the dead–on couches, not in the caskets. My father the funeral director did all these things (and more) during snow storms in both Minnesota and Wisconsin. It is just part of being a funeral director: you never stop working because death doesn’t stop. Posted by John in Funeral Industry and tagged funeral directors, funerals. Bookmark the permalink.